1. Combine the biscuit crumbs together with the melted butter and mix well. 2. Press the mixture into the base of a lined 24cm spring form tin. Refrigerate until firm. 3. Beat the cream cheese until soft and creamy. 4. Gradually beat in the Bulla thickened cream until well combined. 5. Whisk in the eggs and vanilla until well combined. 6. Finally fold through the cool melted white chocolate. 7. Pour the mixture over the biscuit base and bake in the pre-heated oven 150c for 1 hour and 15 minutes. Remove from oven and cool (centre may feel soft but will be firm when cool). 8. Spread the extra melted chocolate in a thin layer on to a large piece of baking paper and sprinkle evenly with the silver cachous. 9. Cut chocolate into small rectangles approx 7 -8 cm high and 5 cm wide. 10. Release the cheesecake from the tin and place onto a serving platter and arrange the chocolate squares decoratively around the edge. 11. 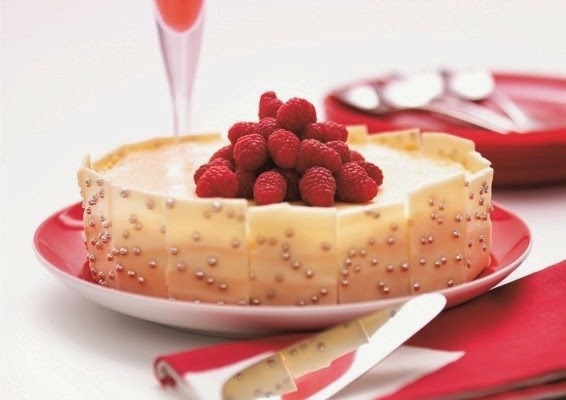 Garnish with the fresh raspberries and serve with a dollop of Bulla Double Thickened cream. White chocolate maybe replaced with dark chocolate and vanilla maybe replaced with coffee or your favourite liqueur. This recipe was kindly shared with us by Bulla Dairy Foods. 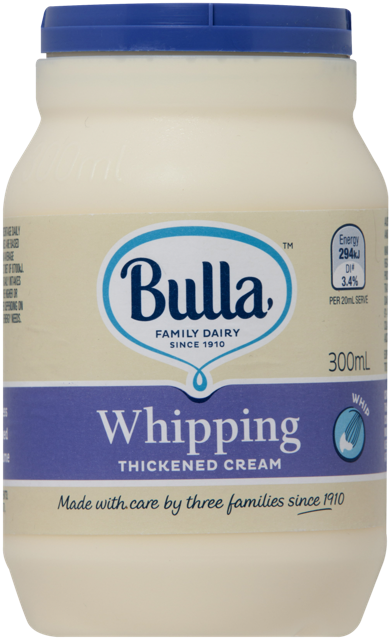 Bulla is one of Australia’s oldest family owned dairy companies, proudly making dairy products in country Australia for six generations. The company is continually evolving its time-honoured traditions to bring families nothing but the best. Bulla is dedicated to making products with more care, craftsmanship & passion from only the freshest milk and cream. Made with care by three families since 1910. Bulla is proud to hold the Australian license to create Cadbury Marvellous Creations Ice Creams and works alongside Cadbury in creating this delicious range, among others, in frozen form.